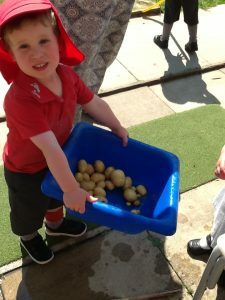 Children in our Little Adventurers class excitedly dug up the potatoes they have been growing in their playground’s vegetable patch. The potato plant has been tended to by the 2-3 year old children with regular watering in this hot and sunny weather. The class finally saw their work pay off last week when Mrs Davis and Mrs Watson dug up the plant and put it in the tuff tray. The boys and girls then felt through the compost to feel for the potatoes. When they found them, they added them to the bowl. They filled a large bowl with fresh potatoes that they can’t wait to taste! How shall they eat them? Roasted, fried, mashed, boiled? !